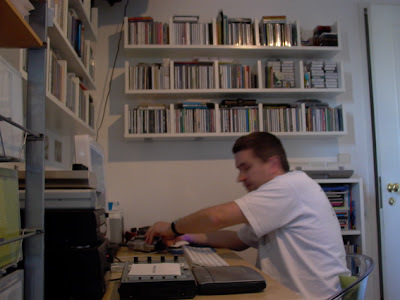 Nuno Moita (turntable, electronics), from Portugal, is the owner of Grain of Sound label, known in the experimental area for publishing artists like Manuel Mota, tu'm, Sawako, Quiet American, Terre Thaemlitz, Lawrence English, Paulo Raposo and others. Nuno has also released his own stuff as ”Stilb” and he's part of Stapletape collective. "Another edition of framework250 tracks this week, featuring emmanuel mieville's collage of open-air recorded moroccan music, michael rüsenberg's field-recording of and brief interview with a uk trash collector, seth nehil's delicately textural composition, and nuno moita and matteo uggeri's melancholic ode to machinery. We also heard a few more tracks from markus jones' ambit din release, and two 3" cdrs by french composer anton mobin. Don't forget, you can reserve yourself a copy of the framework250 double cd, featuring the exclusive tracks above and many more, by donating on the framework website."